1. What are some different applications for your stained glass art? Our stained glass panels are incredibly versatile and can be applied to the interior or exterior of your home in a variety of places. We make stained glass creations for all types of applications, including: windows, doors and cabinet inserts, sidelites, transoms, light boxes, LED Backlit wall units , partitions and more! 2. How & where do you ship your stained glass windows? We ship worldwide using FedEx and RL Carriers. 3. Can you make a stained glass window according to my specific needs, such as size, color, or pattern? Yes, we can make you a completely original window according to your needs, or we can alter one of the patterns displayed on our website to meet your specific size and color needs. YOUR IMAGINATION IS THE LIMIT! The pictures below show how we can manipulate a pattern’s color, size, or even shape and still carry the pattern’s original design. 4. How long do custom orders usually take to create and ship? Most jobs are completed within 3-6 weeks. Large windows or orders for multiple windows may take slightly longer. Custom windows with vinyl framing take a minimum 4 weeks and wood framed window take 6 weeks. 5. How much do you charge per square foot, on average? We generally charge from $90 to $130 for each square foot of stained glass within your window. Windows that are less than 4 square feet will cost slightly more. Also, very intricate patterns and window with a lot of beveled glass will cost more and will be quoted on a job-by-job basis. 6. How do I receive a FAST QUOTE for my particular project? In the rare event that a shipment has arrived damaged, the damage must be reported to StainedGlassWindows.com within 72 hours of the shipments delivery date. Any damage reported within 72 hours of delivery will be taken care of by way of shipment pick-up, repair and return to the original shipping address. 9. Where can I see a palette of colors from which to choose? 10. How do I measure my existing window, door, cabinet, etc. for the stained glass window or insert I will be purchasing? When measuring a traditional square or rectangular window, please keep in mind that not all window frames are perfectly straight even when they appear be. It is necessary to measure the window frame from at least two different places from the horizontal & vertical positions, to check for variations in the measurements. For example, for a 30″ x 30″ glass opening, the stained glass should be made to order at 29 3/4″ x 29 3/4″. Once the window is in place within your frame, any gaps around the perimeter will be cover easily be cover by the wood trim, molding, or silicone. Please note: When measuring a traditional square or rectangular window, please keep in mind that all window frame are not perfectly straight even though they appear be. It is necessary to measure the window frame from at least two different of places from the horizontal & vertical positions, to check for variations in the measurements. To make a custom-sized stained glass window we will need a paper template to ensure that the window will fit correctly when you receive it. To make a template, use a piece of cardboard, or even newspaper to get the accurate measurement for your odd-shaped window. Once again, please be sure to leave a 1/4″ gap on all each side of your opening. 11. Do you sell your patterns for personal projects? We only model our windows after these patterns and do not sell them. You may print or draw the patterns, or trace and resize them, but we simply do not have the manpower to fulfill requests for the patterns. 13. What are the difference between opaque (non-transparent) glass and transparent Waterglass? If you note in the picture above that the opaque colored glasses illuminate really nicely and evenly but will not allow actually sunrays to come within your home. You will also not be able to see out of the window with the naked eye. In most cases both opaque and water glasses will be used within most designs unless there are privacy issues. Please note the Waterglass above which represents the ocean water used within this piece. Waterglass has ripples/waves which mimics water and will provide a fair amount of privacy. The closer you are to this glass the better chance you will be able to make out what is on the other side. Once you are more that 5 feet back from the glass the view will distort enough to where you cannot make out details. Waterglass will omit color from the sunrays in your home and opaque glass will not. The water glass will also give you some really interesting color hues and will interact with the sun and even the street & car lights at night. 14. How are stained glass windows actually made? AutoCAD Stained glass software design. Once pattern is approved we plot out your full pattern. Each piece of paper is placed onto the glass and traced. Each piece of glass is hand cut to perfection. The edge of each piece of cut stained glass is wrapped in an adhesive backed copperfoil. This is what enables the solder to stick together and create the channeling that will hold your window together. Each copperfoiled piece is now assembled like a puzzle on duplicate copy of the original pattern. Once the glass pieces are placed on the duplicate copy, we then start the soldering process which will hold your window together. One completed the window is cleaned, waxed and shipped to another happy customer. 15. How can a stained glass window adapt within my existing window sill? Many people simply press the stained glass panel against their existing window and hold it in place by nailing quarter-round or molding around the perimeter of the stained glass window. In the series of grape window pictures below, the wood trim was painted white as a preference. The wood trim will hold the stained glass in place, which in turn will give the appearance of a “full install”. Also, you can opt to simply use mirror clips to hold your window safely in place. By using either of these options, you will have the benefit of being able to take your stained glass out for reasons such as cleaning or relocating. One of the most popular ways to display stained glass is to use it as a window hanging. All of our windows and suncatchers come with hooks and can be hung easily. To hang the window or suncatcher, simply secure the chains to the wall above the window of your choice. Then suspend your stained glass art at the desired level in the window for a beautiful look that will bring a beautiful look to any room. You can add a further touch of elegance by having us add a decorative wood frame for a slight additional cost. 16. Can you insulate, triple glaze, or seal the stained glass window within two pieces of tempered glass for extra insulation, protection, acoustical reduction and to meet city codes? Yes, we offer this service for any window we build. This usually runs an additional $22 per square foot of glass. This includes the cost for the front and back glass, Super spacer TM weather stripping (rubber gasket for between the windows), and labor. The window will come ready to easily install within your new construction or upgrade of an existing window. The picture below shows a window edge that is 3/4″ thick (can be made slightly smaller on request) after it has been sandwiched between two pieces of clear tempered glass and is ready for easy installation. High wind and storm glass is also available. Clearly, the Super Spacer product line stands alone. We call it TrueWARM because Super Spacer is the world’s only 100% polymer foam, NO-Metal Warm Edge spacing system. Its arrival on the scene in 1989 revolutionized the insulating glass industry, and today, this TSS technology is still breaking new ground in providing the warmest, longest-lasting windows anywhere in the world. 17. What is tempered glass? Tempered glass is the most popular safety glass used that meets Uniform Building Code standards. The heating and cooling process involved in making tempered glass produces a product four to five times ber than standard annealed glass. ACI Distribution’s tempered safety glass is recommended for use as safety glazing for potentially hazardous locations including entrance doors, patio doors, sidelites, and shower doors. If damaged, tempered glass will shatter into small, blunt glass fragments rather than sharper, more dangerous pieces. Tempered glass is the most economical means of meeting safety glazing requirements. 18. How thick is the stained glass window? The stained glass we use is 1/8″ thick. After we install the metal brace bar around the perimeter of the window, the total width is 3/4″ thick. The oak wood frame and tempered glass option will also equal 3/4″ in width. If this poses a problem, narrower widths can be created, depending on the size of the window. Please e-mail us for details. Click on the images below for a better understanding of window widths. 19. Can you make stained glass windows with a wood frame? Yes, we can supply you with a stained glass unit pre-installed within a frame for new construction. Our company will make the glass portion of your order and we will order your frame from one of our trusted and well know US manufactures. We then glaze in our glass unit into the frame at our location and then ship the whole window unit to you for easy installation . Our frame manufactures offer the traditional framing choices such as all wood, wood-clad, vinyl, aluminum, synthetic wood etc. We also can make you a glass unit for your existing frame. Example #2 of a white vinyl awning (crank-out) frame. Example #3 of a Wood-Clad window from Superior Frame Company. Example #4 of an all Wood window from TM Cobb Milllworks. Example #5 – Pine wood sash frame from TM Cobb Millworks. 20. What is the metal brace bar on the back of the window? The metal brace bar on the perimeter of the window gives the window a backbone or frame for stability and durability. It also acts as an easy lip for installation. Without this brace bar the window would flex & bow and would most likely crack when handled or during shipping. The brace bar will make the edge of your window 1/2″ to 3/4″ wide. For larger windows a second brace bar will be added through the center of the window. This additional brace bar will adapted to blend into the design along the lead lines so it will not take a way from the window’s beauty. If you do not want any brace bar the only to get around it is to have it sealed within two pieces of clear tempered glass . 21. What are my camming options & cost for my window? Camming is the lines/channels that hold your window together. This is also called the “Tiffany” construction method & is our most popular choice. This option allows for sleeker lead lines and enables us to design patterns with more detail without the wider lead line dominating the design. 22. Does your company stain it's own glass? Contrary to what many people think, there is not a stained glass studio that actually stains it’s own glass. Rather, the stained glass sheets are made in a larger factory and then sold to stained glass artists to be used within their projects. 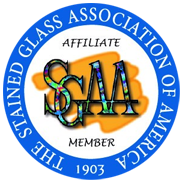 There are over 1,000 different stained and clear textured glasses available on the market today and more being made everyday. 23. An example of iridescent glass? Iridescent coated glass is a permanent factory applied coating which is only on one side of the glass. It is more apparent from some angles than others and is a clever and elegant way to give your windows a touch of subtle color. 24. Can you make windows with odd shapes, such as octagons, arches, trapezoids, or ovals? Yes, we can make almost any size or shape of window. In most cases all we would need is a paper template made out of cardboard or newspaper. This will be sufficient for us to create your window in an accurate manner. View these samples for a better look.